To focus attention on Louisiana’s Historic buildings; to promote interest in the study of Louisiana’s architectural heritage; to disseminate information on Louisiana’s landmarks and to support their preservation. Through the Society’s management and maintenance of the Grevemberg House Museum, the vitality of 19th century life in south Louisiana is showcased, thus making the past more meaningful to present and future generations. In 1972, ribbon cutting ceremonies were held officially opening Grevemberg House Museum. 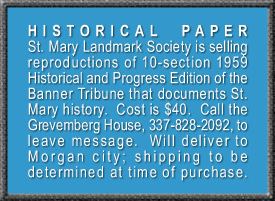 It was through the efforts of St. Mary Landmarks that money and awareness were raised to prevent the demolition of the stately old home, and to begin restoring it to its former glory. 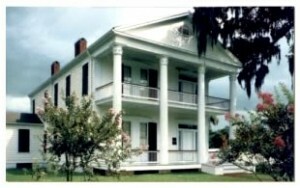 Built in 1851, ownership of the house had passed through many families before it was sold to the City of Franklin in 1948. After decades of use by the city, and years of abandonment, restoration of the house was unimaginable to most. Grevemberg House stands today as a powerful tribute to the determination, hard work and undying dedication of those who shared the vision of a Grevemberg House restored. Grevemberg House Museum and its supporters look back with satisfaction and ahead with anticipation. To join St. Mary Landmarks and be a part of Grevemberg House’s future, contact us.